The first and last time I saw Hillman Curtis speak was at a conference, circa 2000, hosted by the (defunct) American Center for Design. At the time, Curtis was doing a lot of work in Flash, as he was one of the first fierce adopters of this digital medium. Eight years later, Curtis branched off onto a different creative path. Flash-based design for large corporate clients, such as Yahoo! and Adobe, faded from his professional focus, and Curtis became keen on creating photography and film. This Artist Series of films inspired me to look for more from Curtis. While browsing CreativeMorning/New York’s video library(1), I discovered that Curtis gave a Talk in 2009, where he provides useful ways of working. Curtis advanced his interest in people who create, whom he deemed masters of their creative discipline, like his short films on graphic designer Paula Scher, and music-collaborators Brian Eno with David Byrne. His Artist Series celebrates other masters who take on the role of mentors. To inform his practice of taking portraits, Curtis collected portrait photographs to study for lessons in composition, and also to layer contemplation. By using history’s collective experience, collecting is a method of mentorship. (2) It channels the past into the present. Curtis repurposed his photographic and filmic lens to also focus on creative precedence. In his CreativeMornings/New York Talk, Curtis shared his work, but gave awareness to the work of others. Collecting is also a method of patronage. 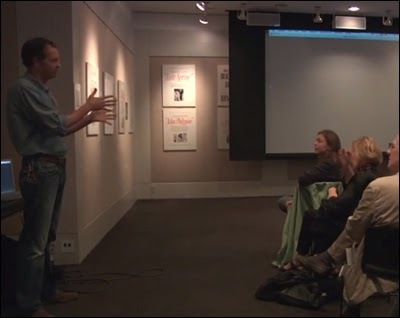 Curtis shared his fascination with the cinematic effect of slow motion with his audience. The world now is increasingly focused on what is fast and instantly gratified—even more reason that Curtis insisted upon using a slow tempo in his work. To him, slow motion is not dull, never dumb—not a waste of time. Slow motion can be visceral. It speaks to a path, taken one step at a time, toward a gradual body of work. Evident in his storytelling, Curtis’ use of the slow-motion effect requires viewers to be patient. Being open to slow motion is welcoming the revelation of patience. Slow motion counters the ease to be oblivious. Through his work and talks, Curtis encourage us to: Find mentors, past and present, to glean lessons and draw inspiration from. Collect for preservation and reverie. Not overlook the benefit of slowing down. Hillman Curtis passed away in 2012, leaving behind a legacy of creative drive and timeless body of work. Thank you, Hillman Curtis, for your craft, knowledge, and encouragement to invent and reinvent! (1) To echo my tweet, the growing video library of CreativeMornings Talks, from all chapters, is a gift that keeps giving. (2) Mentors and mentorship are vital. Read my first reflection. Typeface of quotes is Franklin Gothic, originally designed by Morris Fuller Benton in 1902.